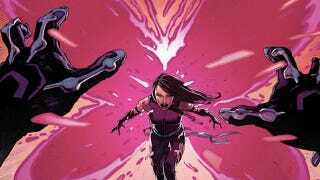 All this week, we've been gearing up for the conclusion of the "Dark Angel Saga" storyline in Uncanny X-Force, one of the most rollicking X-comics to date. Uncanny X-Force #18 hits stands next Wednesday, December 14. You can read a synopsis of the story so far below, and here's our recent interview with Rick Remender and a brief history of all things X-Force.